Thursday’s demonstration marks the first of three planned days of protest to raise awareness about the impact of PFI projects on Britain’s schools and hospitals. It was organized by The People vs PFI – a collective of grassroots organizations, students and NHS patients who are calling for Britain's PFI contracts to be rendered null and void. The campaign group argues the PFI deals are toxic for Britain’s public purse, and are operated by the private sector “for the private sector.” It warns overpriced PFI contracts, dependent on criminally rigged Libor rates, have burdened British tax payers with debts of up to £222 billion. As this debt continues to mount, the campaign says PFI schemes are facilitating the “institutionalized theft” of ordinary Britons. PFIs have been adopted in many states worldwide as part of a broader program of privatization and financialization. First introduced in Britain under ex-Tory PM John Major, they were set up to use private capital to fund public infrastructure development. Concern is mounting in Britain that these lucrative contracts enable service contractors, construction companies and offshore firms to profit as Britain’s schools and public hospitals crumble under the weight of unsustainable debt. The costly and clandestine nature of these deals has been denounced by campaigners, academics and MPs across Britain's political spectrum. Professor of public health research and policy at Queen Mary University, Allyson Pollock, is a leading voice on PFI contracts in Britain. Pollock has long asked why Britain’s Serious Fraud Office (SFO) has not forensically scrutinized PFI contracts that weresigned on the basis of rigged interest rates - causing related repayments to increase annually. She is calling for the SFO to investigate the matter. Speaking to RT on Sunday, Pollock said Britain’s PFIs are drivers of “service closure and privatization” due to the “high cost” of servicing related debts. Asked whether Britain’s PFI debts should be written down, Pollock declined to specify. Barclays’ stake in Britain's 720PFI projects remains largely obscured from public knowledge, despite the fact the bank presides over 60 such contracts. The PAC's probe also uncovered Britain’s Treasury knew little about PFI investors’ tax arrangements. The Treasury was unable to clarify at the time whether PFI investors had paid tax in Britain on profits or equity gains – or whether Britain’s tax authorities had collected corporation taxes from PFI. Barclays boasted a 6.1 percent share of Partnerships UK,a Treasury taskforce set up toadvise public authorities on brokering PFI contracts.The initiative was privatized by Labour in 1999/2000, and offered advice to local councils on PFI deals after its founding. The People vs PFI argue Partnerships UK was anything but independent, and acted in the interest of big business. It also warns of a conflict of interest, given the body was “51 percent owned and staffed” by banks that profit from PFI deals. 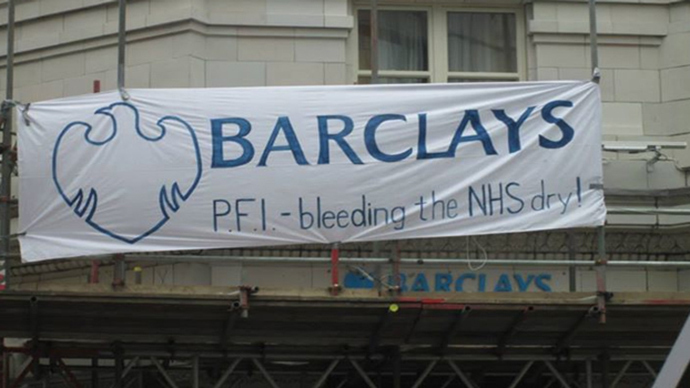 Through Partnerships UK, Barclays offered financial advice to local councils in Britain on prospective PFI deals. It also extended loans and “interest rate hedging products” to various PFI consortia, while manipulating the Libor interest rates upon which these contracts were based. Campaigners representing The People vs PFI insist Barclays’ actions in this context were deliberate, self-serving and criminal. They argue Britons should not be liable for debts hinged upon fraudulently rigged Libor rates. Barclays' AGM began at 10am on Thursday, and continued throughout the day. Throughout the course of the meeting, campaigners present challenged the bank on how much profit it made from Partnerships UK, how much tax it dodged on lucrative PFI projects, and how many PFI contracts it presides over since the 2013 sale of its infrastructure wing to London-based venture capital firm 3i. Addressing Barclays at the AGM, investigative journalist Sid Ryan sharply criticized Partnerships UK. Barclays has "ended up on both sides of the table, profiting from and advising on a program described as a disaster across the political spectrum," he said. Ryan, who has conducted research into PFI deals, inquired what "fees, dividends, and other income" Barclays made from from advising on PFI contracts. He further asked whether the high street bank had ever acted as an advisor on other projects it had an interest in. "Taxation on PFI profits remains an area of interest for the Public Accounts Committee, which brought the Chief Executives of two offshore PFI investors in for questioning and roundly attacked their approach to capital gains tax," Ryan said. "Considering the disposal of Barclays Infrastructure Funds Management Limited in 2011, can the board please give a breakdown of the taxes paid so shareholders might avoid a surprise in the future?" Barclay’s has also been criticized for aggressive tax avoidance, with its now defunct Structured Capital Division being previously dubbed a “tax avoidance factory.” The tax dodging scheme met its final demise in 2013, as revelations regarding Barclays’ role in the Libor rigging scandal became apparent.